The Goodwood Revival is one of the most prestigious events on the race calendar for any historic racing fan and competitor and it is no surprise that the iconic event will be celebrating its 20th year in 2018. Nick Swift reflects on his own 11 years of competing at the most iconic event on the historic racing calendar. Going all the way back to 2007, Nick was pushed into the driving seat of the unique Wolsely Hornet belonging to Norman Grimshaw (well, he nearly made it to the driving seat). “Norman dropped out last minute, so he asked me to be his replacement alongside touring car champion Alec Poole. It was my first opportunity to race at the Revival, and I was raring to go”. Unfortunately while in the hands of Alec Poole it was sadly rolled and very badly damaged which meant that was the end of the weekend for the Poole/Swift team and Nick didn’t get his eagerly awaited drive. “2009 has to be the best revival for me personally. 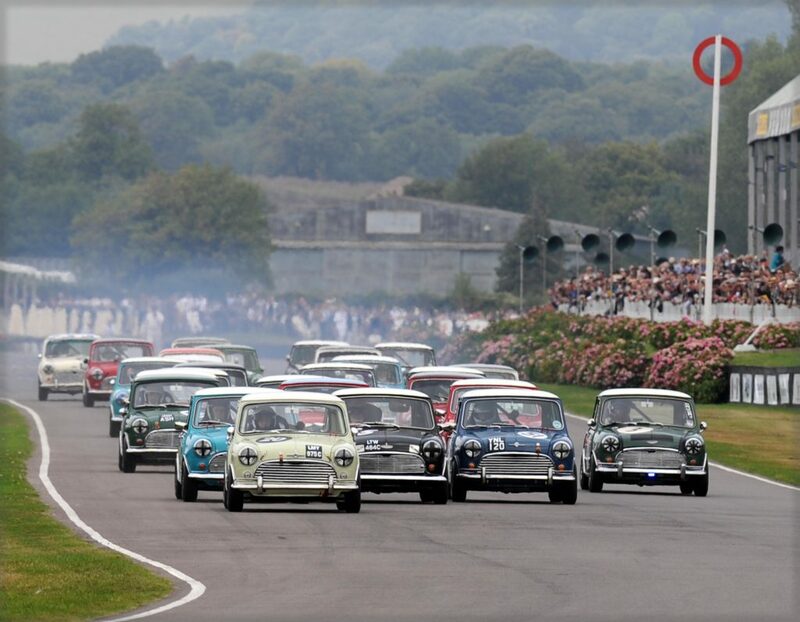 Goodwood hosted the first and best one make race featuring 30 FIA historic Mini’s with half the grid running Swiftune engines and every car running at least one Swiftune component!” The race was in celebration for the Mini’s 50th anniversary and has now gone down as the most iconic Mini race to date. Months of determined work by Nick and the Swiftune team was rewarded when Nick and driving partner Le Man winner Oliver Gavin won both races and finished first overall by 15 seconds. Swiftune scored a brilliant 1st, 2nd, 3rd positions in this epic Mini race. “The all Mini race is my best memory of competing in the Revival and can’t wait for the next all Mini race”. In 2010 a race for small British sports cars made its debut at the Revival, names the Fordwater Trophy, featuring Mini Gem’s, Lenham Midget and a unique Mini Dart. Nick was invited to drive Stefan Wray’s unique Swiftune powered Mini-based DART. Nick put the rapid dart on pole and went on to secure a victorious win in the race. In 2011, Nick was joined by Aston Martin works driver Darren Turner who was delighted to swap his Aston Martin LMP1 for a Mini. The popular David V Goliath battle between the mighty ford galaxies, Cortinas and BMW kept the crowd pleased, who were cheering on the underdog the whole way. The pair finished in an un-expected yet admirable third place for the little Mini. A very pleased Swift summed up, ”This third place was probably more satisfying than winning the all Mini historic race at Goodwood in 2009 because then we were the favourites, this weekend I thought sixth would be the best we could hope for.” Fast forward to 2013, Nick reunited with Oliver Gavin in the then newly built Willow Green Swiftune Works Cooper S. Oliver took advantage of the wet weather and put the rapid Mini on pole in qualifying. It was a 1,2,3 for Swiftune in the Mini class in the race, with Nick and Oliver taking 1st closely followed by Jason Stanley and Rauno Aaltonen, TV chef James Martin and Andy Harrison finishing in 3rd. Swiftune have had great success at the Goodwood Revival, including 2 wins and 4 pole positions, in their 10 years of competing. Nick will be back this weekend with Willow 2 looking to continue their success, partnered with Aston Martin drive and Le Man 24 hour winner Jonny Adam. Nick has also been invited to take part in the celebratory winners parade along with Willow, every day of the weekend. It’s going to be a busy weekend, see you there!